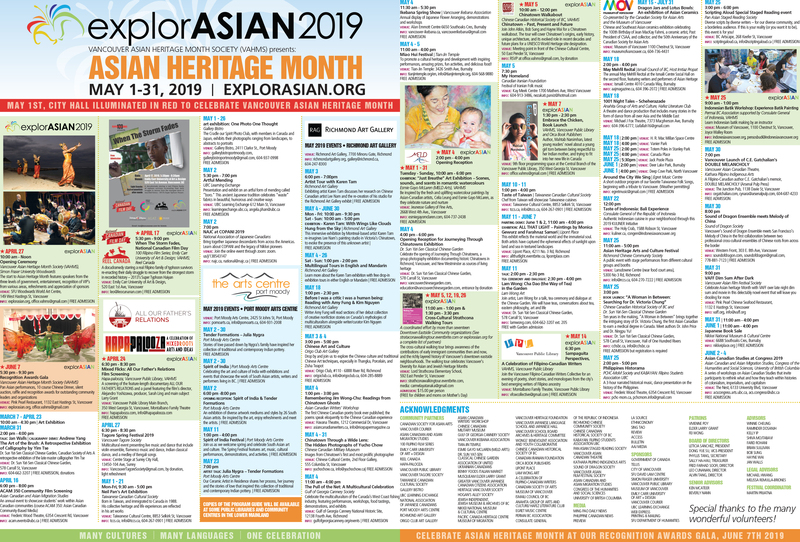 The Vancouver Asian Heritage Month Society (VAHMS) is now accepting submissions for promotion of events for the explorASIAN 2018 Festival. This festival recognizes National Asian Heritage Month each May by building bridges between mainstream and Pan Asian communities in the celebration of multiculturalism and diversity. This year’s festival, “Pan Asian Routes” and will place a special focus on Pan Asian migration and the legacy, culture and accomplishments of the growing and diverse communities of Canadians with Pan Asian heritage. As a non-profit society, we provide a free service to support our partners by promoting Pan-Asian events through our explorASIAN channels. If you would like to join us, please complete the submission form in this link send a JPG image of your logo and event poster to office.vahms@gmail.com by Friday, March 2nd 2018 for inclusion in the Vancouver Courier, explorASIAN program guide and on our website and social media platforms. Our vision is to build a community where Asian arts, cultures and contributions are lived, shared and celebrated as part of the harmonious diversity of Canada.